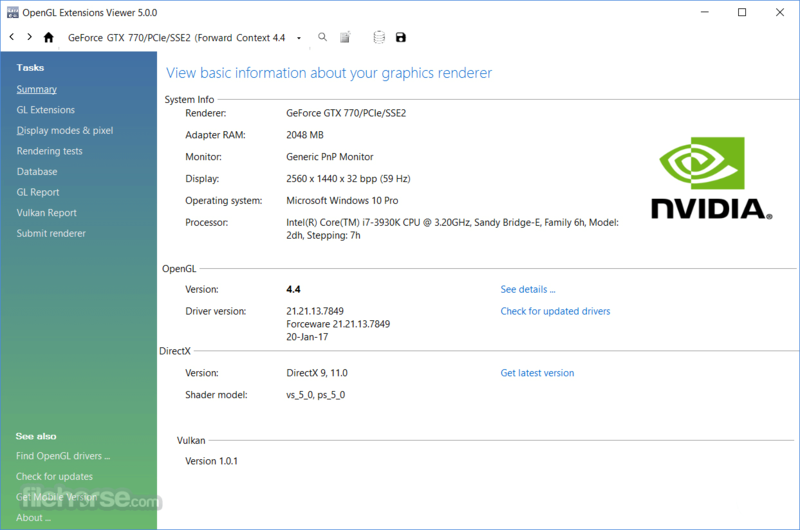 OpenGL Extension Viewer is reliable Windows program which displays the vendor name, the version implemented, the renderer name, and the extensions of the current OpenGL 3D accelerator. Many OpenGL extensions, as well as extensions to related APIs like GLU, GLX, and WGL, have been defined by vendors and groups of vendors. The extension registry is maintained by SGI and contains specifications for all known extensions, written as modifications to the appropriate specification documents. The registry also defines naming conventions, guidelines for creating new extensions and writing suitable extension specifications, and other related documentation. OpenGL Extension Viewer is a great free application for Windows PC providing you with information on OpenGL extensions!